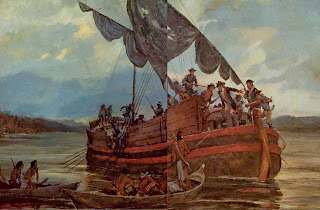 These paintings are from the book "Marines in the Revolution", available for free at https://archive.org/details/MarinesInTheRevolution. While most of the book's illustrations are of the Continental Marines, there are a few which deal with other marines. All paintings are by Major Charles M. Waterhouse. 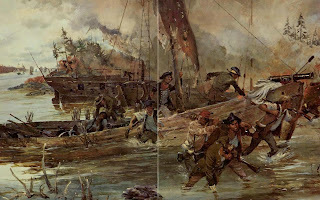 The first (chronologically) shows panicked American troops trying desperately to salvage something of their beached gunboat during the Battle of Valcour Island. 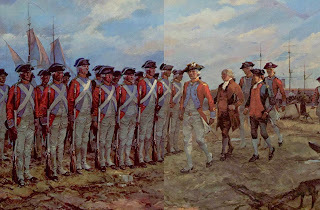 The next painting shows John Adams and John Paul Jones reviewing men of the prestigious Regiment Walsh (previously Regiment Rooth, and before that, James II's Foot Guards). 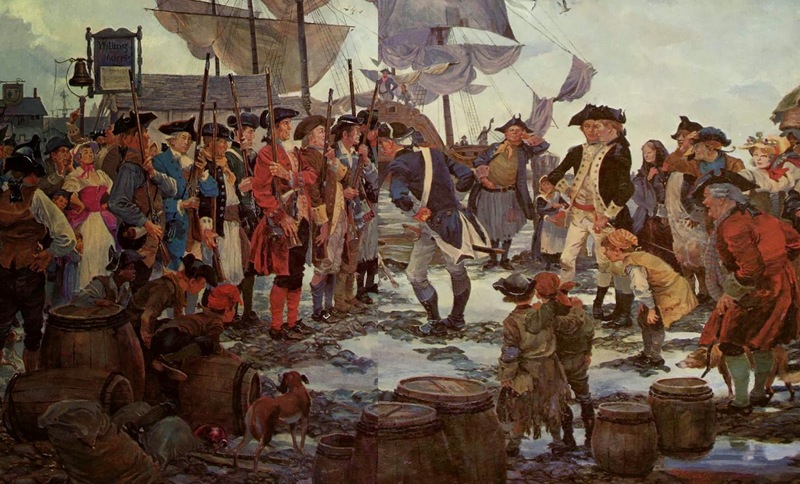 Men of Regiment Walsh served aboard the Bon Homme Richard in its battle with HMS Serapis. This picture is of an oared galley, the Miami, plying the Ohio River. Its crew of Virginia State Marines are there to keep frontier Indians from taking up the tomahawk against colonial settlers. And last, a scene so universal in the 18th Century: the training of new recruits. The new troops hold their muskets awkwardly and not in unison as an officer barks orders at them. Two other officer stand back, amused, as the townsfolk look on.